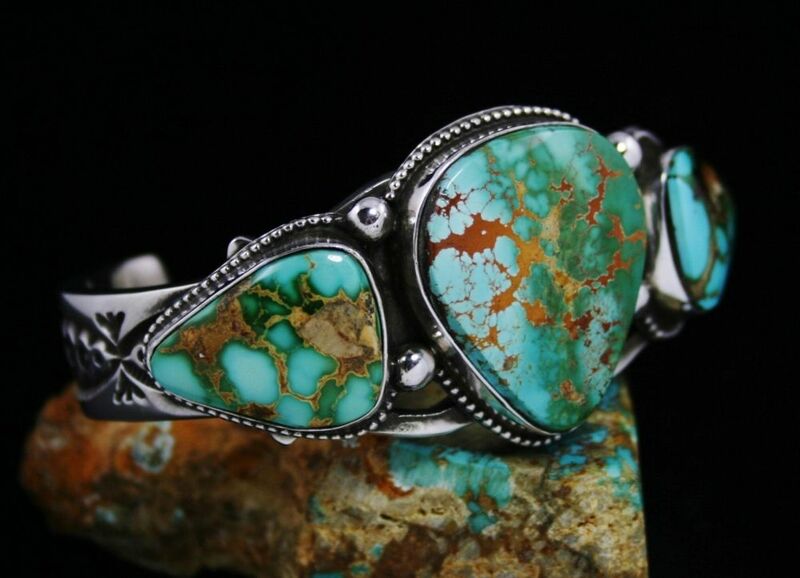 These three natural turquoise gems are the grade and color that makes the Royston mine one of the great classics of all known deposits. 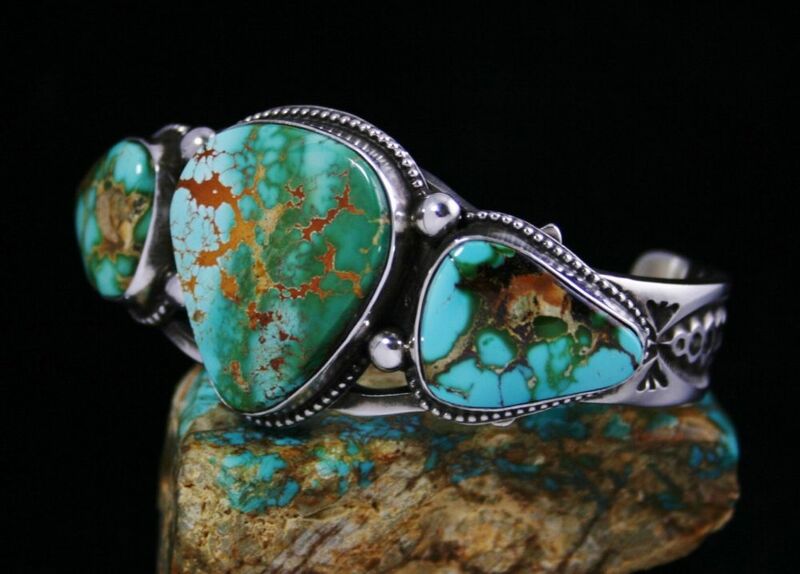 Gorgeous light blues swirl together with deep greens in a marvelous display of vibrant color. 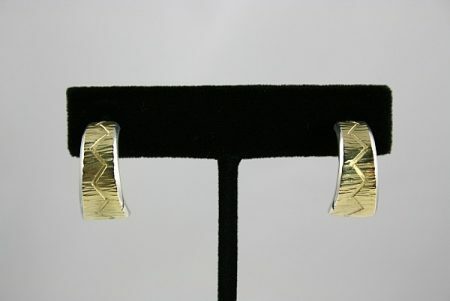 Fine golden spiderweb host rock matrix dazzles the eye. 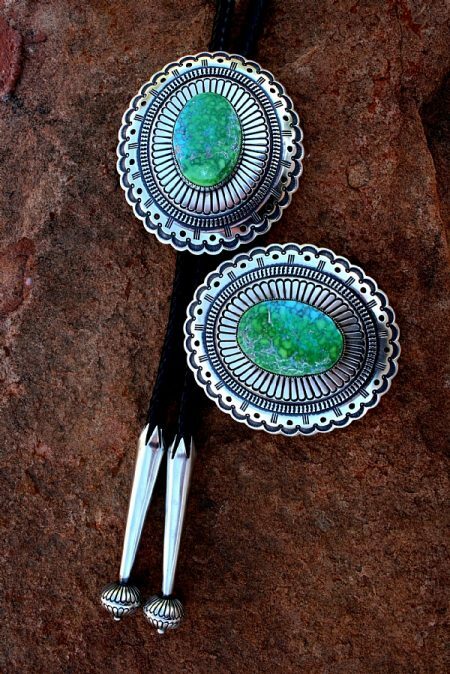 Navajo artist Terry Martinez has complimented the three matching stones with hand made bezels and a border of petite droplets with large silver beads in between. 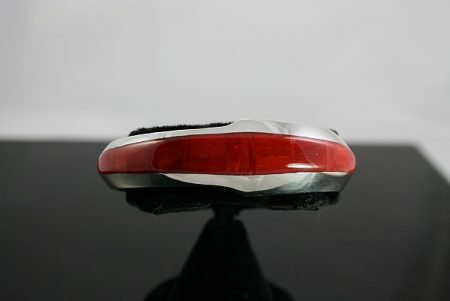 Below a thick shank was rolled out of ingot sterling silver and pounded into shape. 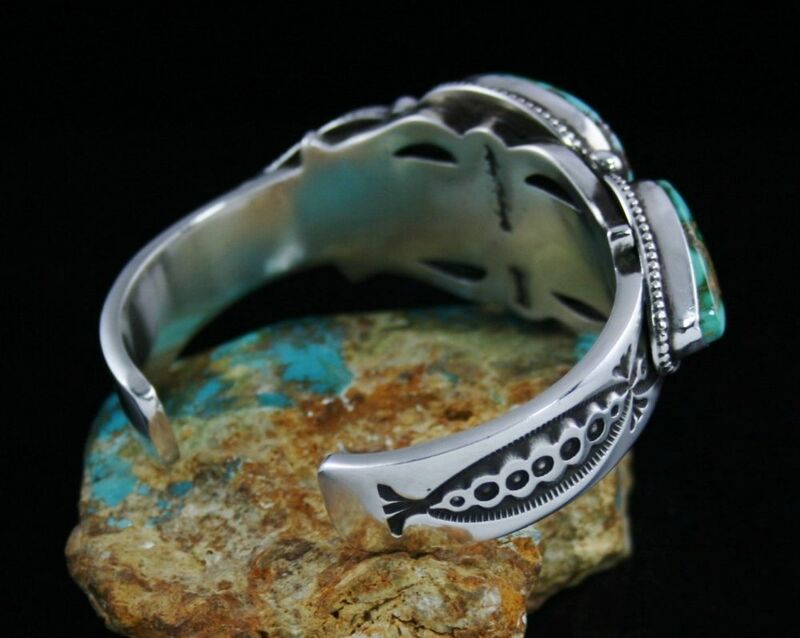 Deep stamping on the ends finishes the bracelet with beauty and precision. 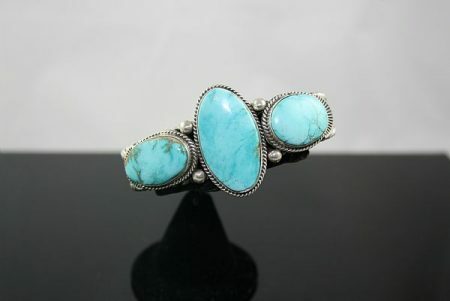 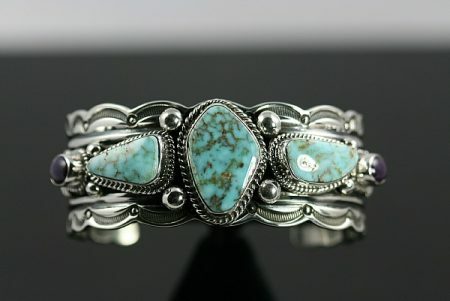 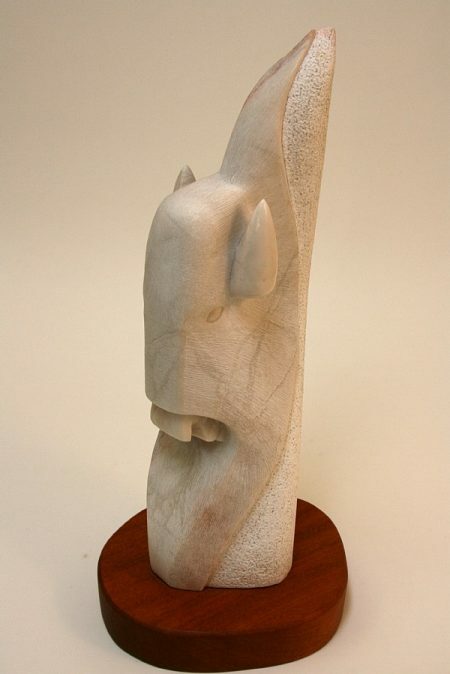 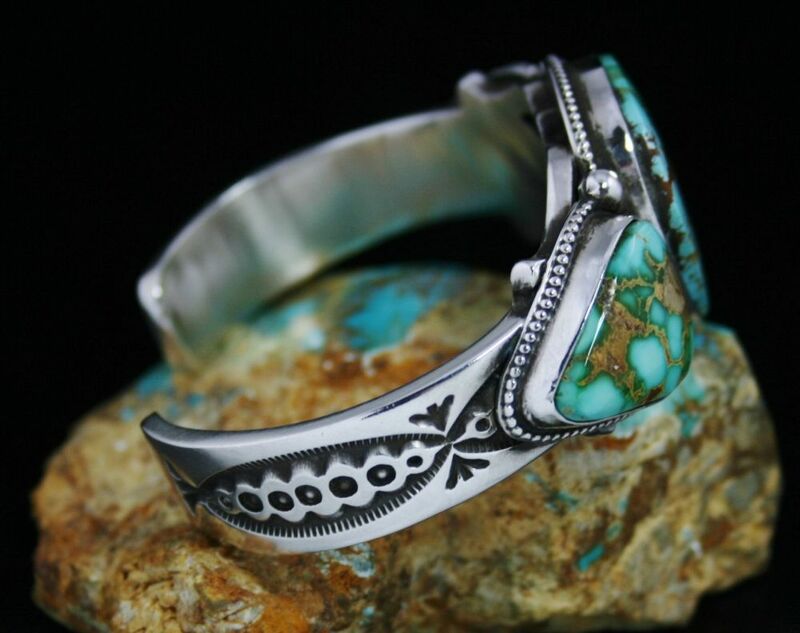 This piece created by Navajo artist Andy Cadman features three large rare light color Easter Blue turquoise stones and beautiful traditonal design. 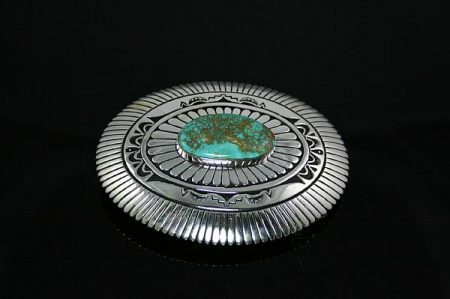 This incredible one of a kind piece created by Navajo artist Delbert Gordon features a spectacular rare high grade Crow Spring Spiderweb turquoise cabochon. 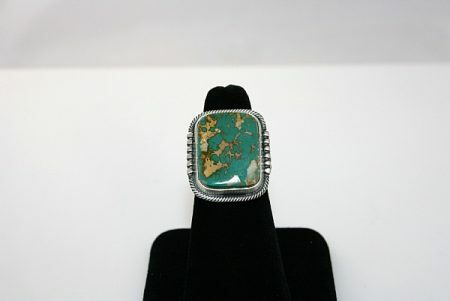 The stone has a spectacular high dome and is a gorgeous green-blue with reddish-brown and orange spiderweb matrix. 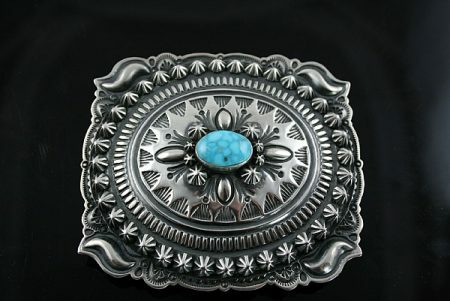 The silver work of this item is also unique with cutouts, sterling silver drops and amazing detail. 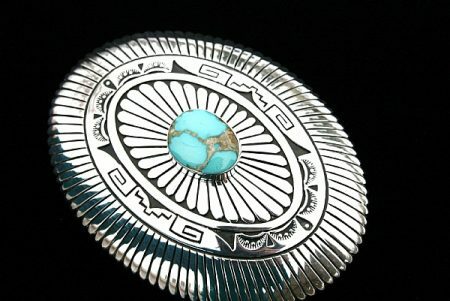 This beautiful piece created by award winning Navajo artist Alfred Joe features exceptional design in solid 14K gold over sterling silver. 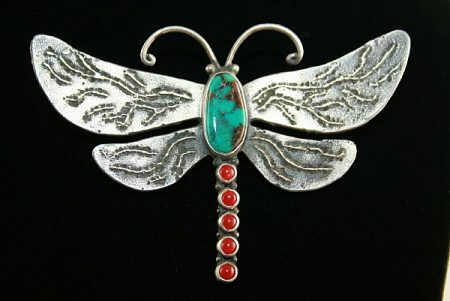 The artist included gorgeous v stamp symbols extending the length of the piece with incredible contemporary silver work. 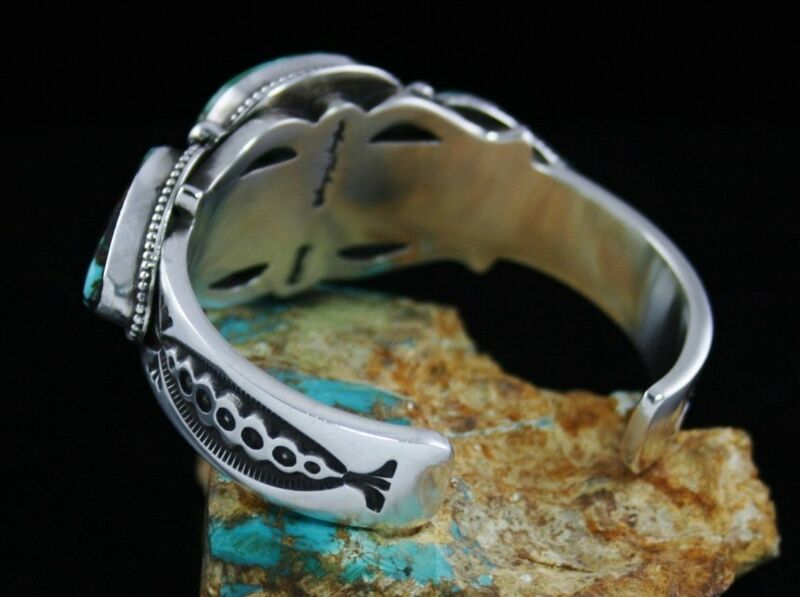 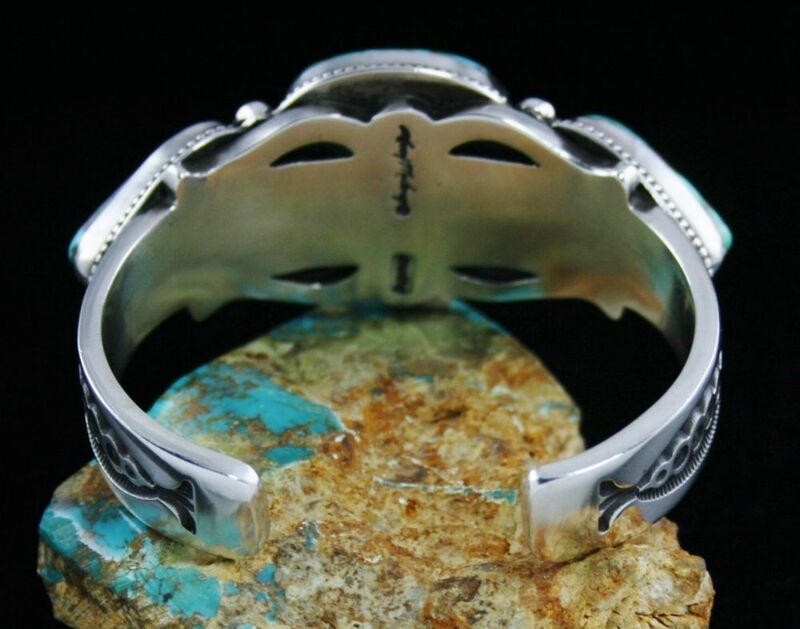 This incredible piece created by award winning Navajo artist Jim Harrison features a beautifully inlayed Yeibechai in the upper portion with a stunning contemporary design in sterling silver. 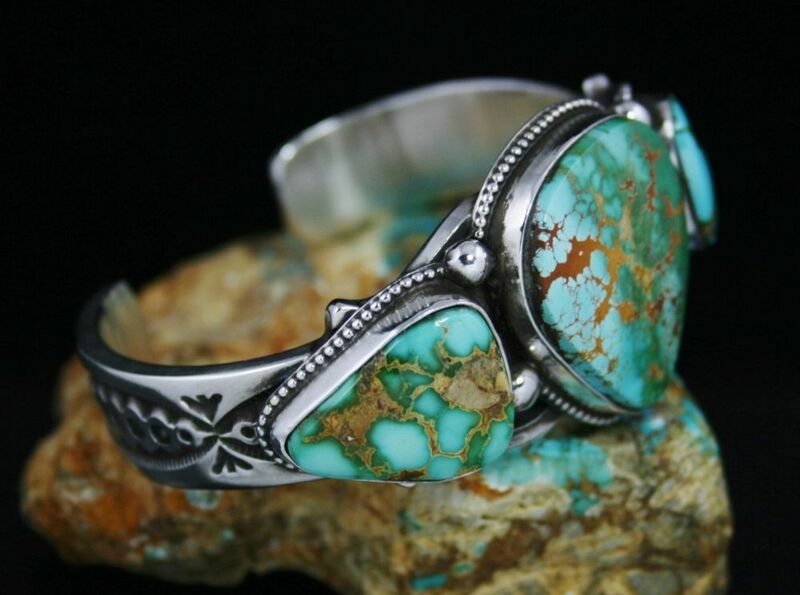 This item includes the use of gem grade Mediterranean coral, sugulite, rhodinite, White Buffalo, and lapis lazuli. 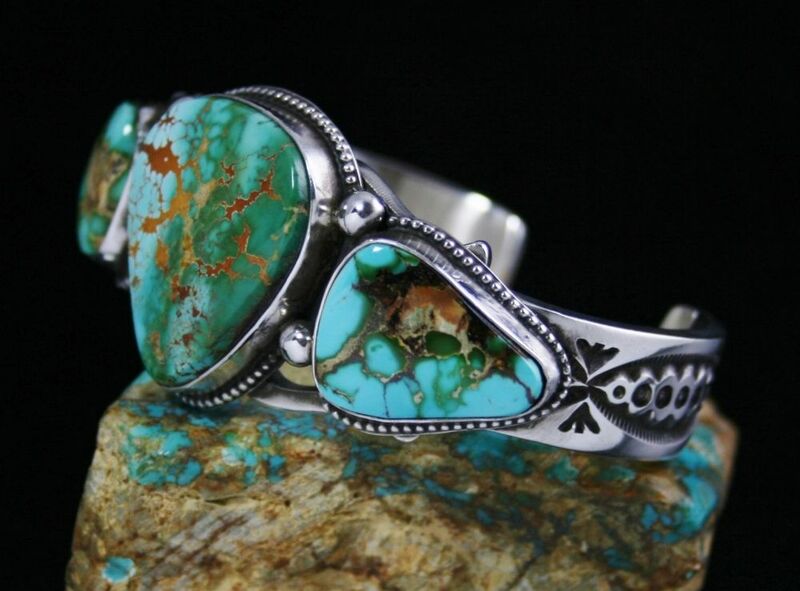 This amazing piece was created by award winning Navajo artist Charlie John and features a beautiful Easter Blue Spiderweb turquoise stone. 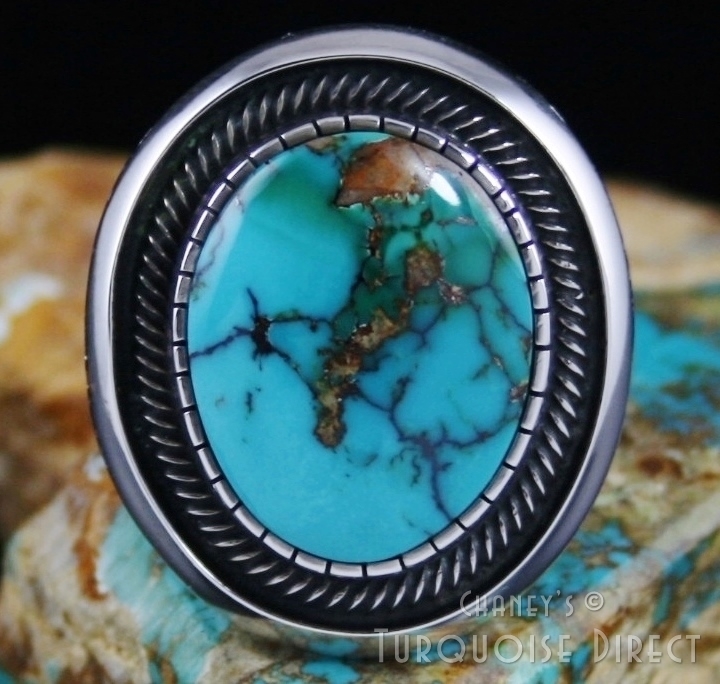 The cabochon is a stunning blue green with tight golden brown spiderweb matrix. 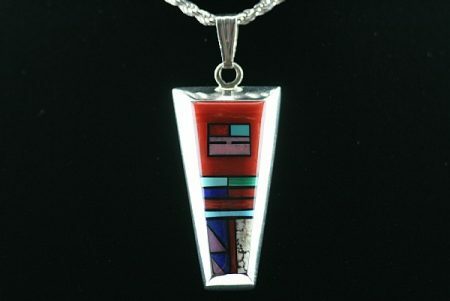 The item also portrays gorgeous design work in sterling silver. 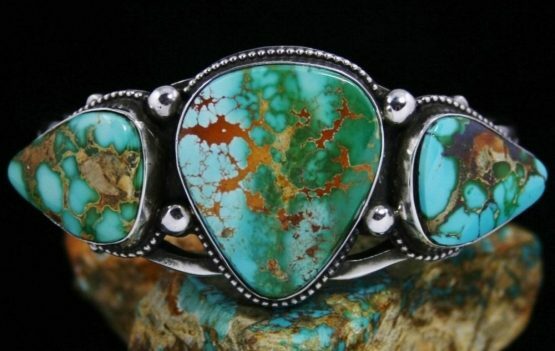 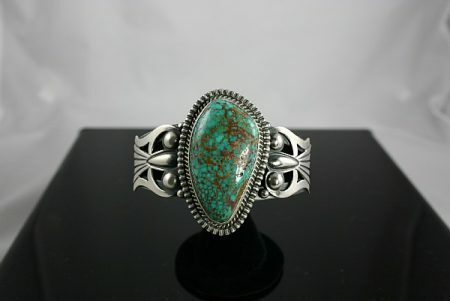 Inspired by the classic concho belts of the 1890's, this incredible one of a kind piece hand fabricated by award winning Navajo artist Sammie Kescoli Begay features two gem grade Carico Lake Spiderweb turquoise cabochons. 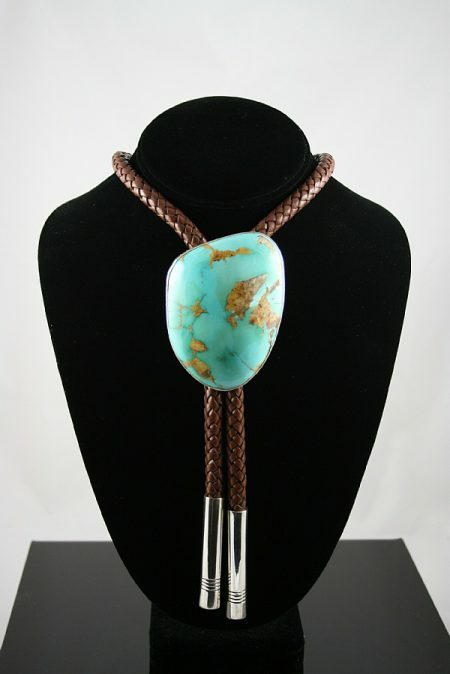 The stones are each an outstanding lime-green with a flush of sky blue with tan and chocolate-brown spiderweb matrix. 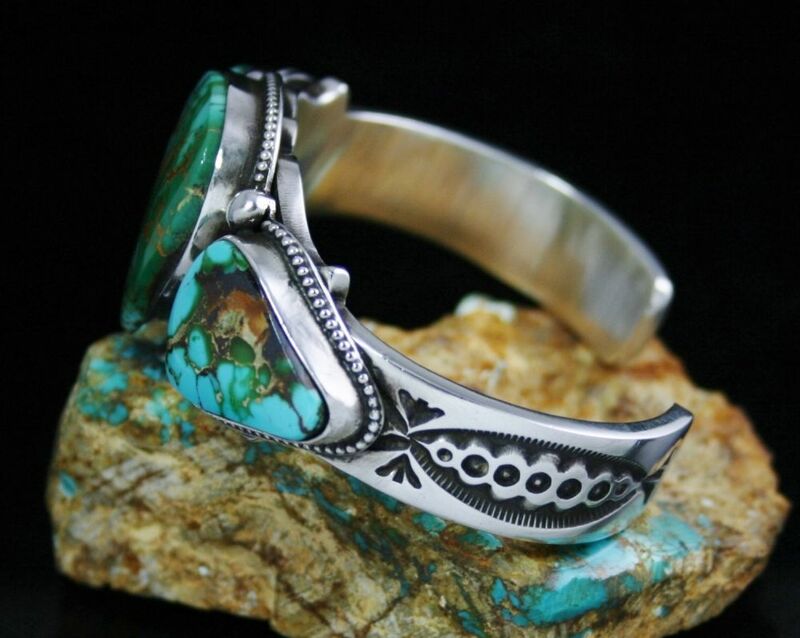 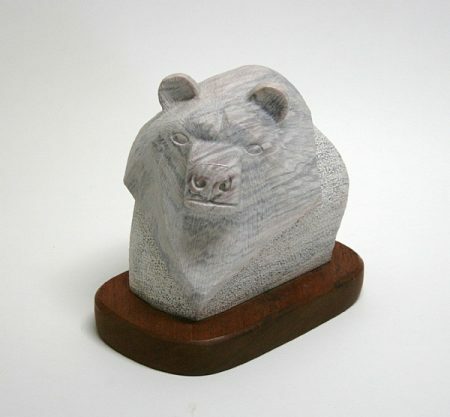 Sammie revives the classic tradition of hand rolling and hammering sterling silver ingot. 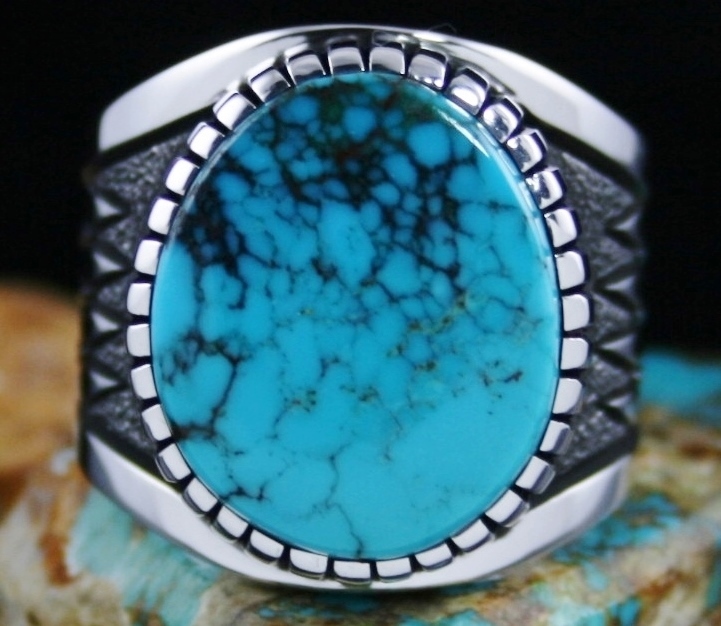 This is a very unique and labor intensive technique.